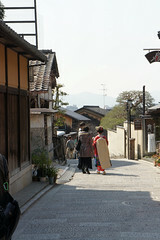 Each time we’ve been to Kyoto and wandered the winding streets of Gion, we’ve come across young (and not so young!) 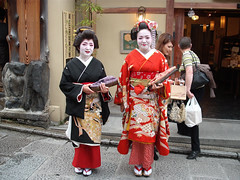 women dressed in traditional maiko (apprentice geisha) and geiko (Kyoto name for geisha) clothing. The first time we encountered them, we presumed that they were the real deal, but posting pictures on Flickr yielded information from maikophiles that revealed them to be women playing dress-up. And why not?! 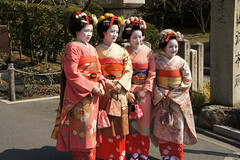 If you’re obsessed with Japan, dressing up as an iconic maiko or geiko must be fun. 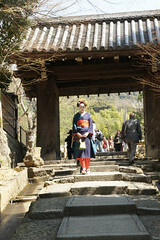 The process is known as maiko henshin (舞妓変身), which means maiko transformation. In the picture above, the woman on the left has had a geiko henshin. There are a few studios around Gion that will dress you and photograph you for a fee, and offer different packages that allow you to head out into Gion in your costume so that you can be photographed alongside temples, shrines and in other picturesque locations. Kyoto Prefecture’s tourist guide has Maiko Henshin studios in their list of places offering the chance to experience traditional culture in Kyoto. One tell-tale sign that you’re looking at Maiko Henshin and not professional Maiko is the height of the okobo (platform flipflop style shoes). Professional Maiko will be wearing very high okobo, but because people having a Maiko Henshin aren’t used to walking in okobo, the studios use half height okobo. Because of the number of people wearing them, they can also become very worn down and consequently lower than half height! 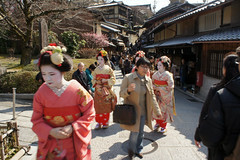 The presence of draw-string bags is also a sign, as most professional Maiko don’t carry much with them. Tourists tend to have cameras, purses and other day-to-day necessities with them, so are given a matching bag to carry them around while they are on their stroll. Our favourite Maiko Henshin was a young lady we encountered with her mum outside one of the temples near to the entrance to San’nenzaka. She had just graduated from high school and her mum had paid for her to have a Maiko Henshin. They were strolling (it was more like trotting, as the mum powered her daughter around as many sites as possible in the hour you get from the studio, judging by the number of locations we saw them and the speed we saw them walking at!) around Gion so that the mum could take photographs of her pretty daughter at lots of different places. She seemed quite shy, but was happy to pose for photographs for me and an American family who had a daughter roughly the same age. She even stopped for a chat with them. 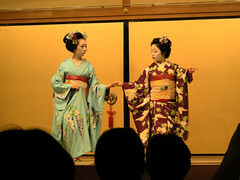 So far, then, the only professional Maiko that we have seen in Kyoto are the women who were dancing at the show we saw at Gion Corner on our honeymoon. The Asakusa area where we have always stayed in Tokyo is also apparently a geisha district (known as a hanamachi) but again we’ve never seen any geisha while we’ve been there. Maybe some time in the future we’ll be luckier!